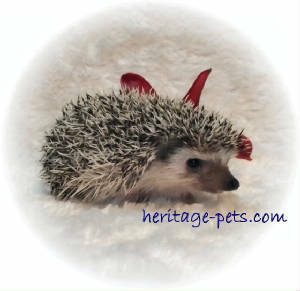 to any person without reason"
" Prices subject to change without notice "
Of course this price guide isn’t carved in stone but it should give you a fairly good idea of what you might expect to pay for a good ‘pet’ quality hedgehog from a reputable breeder. That way you can plan ahead and budget accordingly. Normal Colours are those that many of us are familiar with. Some are commonly seen the wild while a few others were some of the first colours that were selectively bred when hedgehogs started to become domesticated. Most of these colours can be found in both the Algerian or the White bellied varieties. ALBINO - Males or Females start at $125.00 but prices are based on lineage and therefore it is not uncommon to pay in excess of $200.00 for one. Visually, all albino hedgehogs lack any noticeable true colour pigment however they do mask colour and can pass that colour on to their offspring. While albinism is not considered a colour the word albino is used to describe the lack of all colour. Albino should never be confused with white (or any other colour. Albino animals can certainly be a huge asset to a breeder because when paired with the right mate they can certainly add a lot of colour to breeding program. 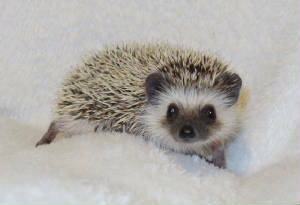 A hedgehog that is referred to as a "Snowflake or a Silver or a Chocolate chip" has coloured/banded quills mixed in with approximately 30% to 70% of white quills. This gives the appearance of having a light silver hue or having been dusted with snow. Snowflakes are a little uncommon but they are not rare. 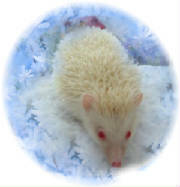 Although all hedgehogs change their colour as they mature Snowflakes change drastically as they mature. Commonly referred to as black-eyed whites. 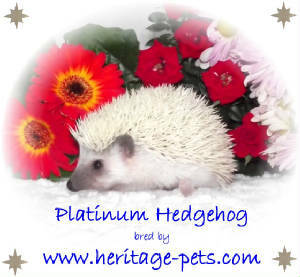 This group also includes Platinum coloured hedgehogs They are no longer quite as rare as they once were but could quickly disappear from the hobby if breeders switch their focus from this colour variety to another variety. We really like working with these colours in our breeding program. Visually, they offer a lot of contrast and can be a good choice for people wanting something a little flashier. Good quality, true whites and double whites can be very challenging colours to reproduce and this part of the hobby is probably best left to breeders who have good comprehension of the hereditary influence and colour genes. PINTO VARIETIES - Pinto is not considered a true colour but rather a colour pattern. It can be any colour with a pattern of spotting or patches of white, which is void of colour mixed in with another colour. The amount of white may vary in size from as little as dime size patches to as 90 % of the animals’ body being covered with white patches. Most often when the amount of white spots covers less than 25% it is referred to a regular Pinto. Pintos are quite stunning and a little unusual. They can be a little more challenging to produce in a breeding program. When the amount of white spots covers more than 25% of its’ quills it is referred to a High White Pinto. 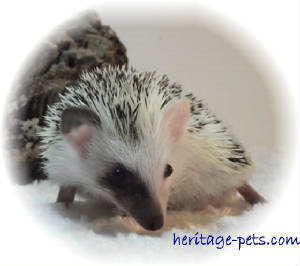 High White Pinto patterned Hedgehogs usually start at $50.00 more than the price of regular colours. When the amount of white is greater then the amount of colour it creates the illusion that these are white hedgehogs with darker markings. This pattern is often referred to as a Reverse Pinto. These are extremely difficult to produce and if you are lucky enough to find one they are especially helpful in a colour-breeding program for breeding High White pintos and Split Faces. These are hedgehogs that carry both the Snowflake and the Pinto gene. As pets, they can be quite attractive. Breeders need these if they want to produce Split Face Babies. Whenever possible we use Algerian H.W. 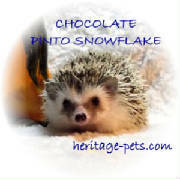 Pintos to Algerian Snowflakes in hopes of producing good quality Pinto Snowflake Hedgehogs. SPLIT FACE PINTO - Males usually start at $250.00 and up depending on markings. Depending on their markings, some breeders will use many cute names in an attempt to describe them; Ringed or Raccoon eyes, Mottled faces, Half-masked etc. These are all pintos that carry a snowflake or dilute gene. Each is unique in that they all have very unusual facial markings and body markings. At heritage-pets.com, we enjoy working with Split Face. We only use double dilutes (Whites) that carry high white pinto genes bred to reverse pintos that carry the double dilute genes. We have found that when these genes are combined they babies born have a lot of dark contrast and are quite stunning. 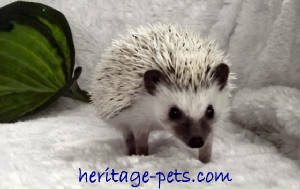 This colour pattern is currently the most sought after of all the hedgehogs that we raise. RETIREES - We do not breed any of our animals after they are 18 months old. They are offered for sale to pet homes while they are still young enough to make good pets. They are sold for 25-50 % less then the regular price of a baby of the equal colour. To us being a responsible Breeder means that part of our responsibility includes being actively involved with offering sanctuary to animals in need. We often offer take in animals and provide care (including veterinary care if needed) for them until a more permanent home can be found. When we feel that these animals are ready for new homes, they are offered to experienced caregivers who can provide a permanent home for them for the rest of their lives. Five factors that influence price. Age: Baby and breeding age adults are usually a little higher in price. Newly weaned babies around 7-10 weeks of age are usually more in demand because this is the best age to purchase one if you are planning to raise it and keep it solely as a pet. Typically babies have not yet had the time to form habits are more adaptable than older animals. Breeding age animals have been kept back by the breeder to give him or her time to determine the quality of the animal before they decide to add it to their breeding program. This costs the breeder more in time and money. Purchasing a breeding age animal certainly has its’ advantages but it will likely cost a bit more. Gender: Quite often males are priced a little less than females because breeders usually keep more females than males and females are usually only bred once or twice before it is replaced. Colour variety (rarity): The more unusual the colour the harder it is to find and therefore they are usually more costly. With hedgehogs what is considered a rare colour, might only be rare for a year or two and could soon become a common colour because newer colours and colour patterns are evolving all the time. Breeding for specific colours is a matter of understanding colour genetics and that can be very confusing for a lot of hobbyists. Availability: In Canada, winter tends to be the time of year when many people are indoors more often and have more time to commit to bonding with a new pet so, a lot of people wait until this time to purchase exotic pets. 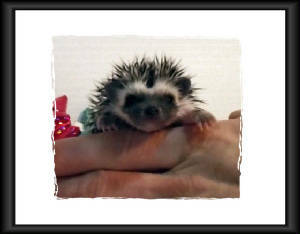 Typically hedgehogs tend to breed and raise babies more often during the spring. Consequently during the summer months there are more babies to choose from and the prices of may be a little lower. 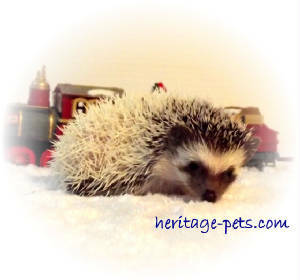 During the cooler months many hedgehogs are simply not interested in raising a family. Hence there are fewer babies available and prices are slightly higher. Breeder versus pet quality: Breeders seldom disclose that they have a couple of the best breeder and "show" quality animals that they are holding back for themselves. Therefore if you are looking for a breeder quality animal it is always a good idea to be up front and ask the breeder if he or she has any top quality, breeding animals they might consider selling you.